The Interactive Fiction Competition (IFComp) has launched! 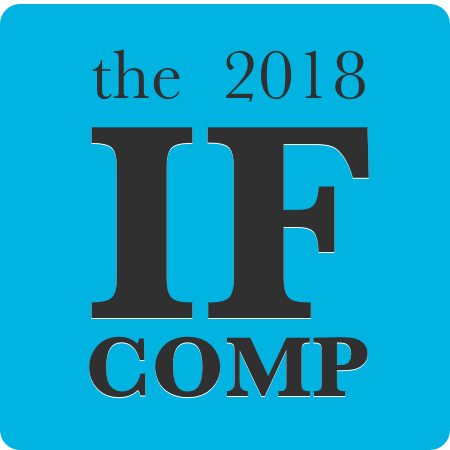 IFComp is arguably the largest competition for the medium and the number of entries each year has grown at a terrifying rate. I could have miscounted but it looks like there are 77 entries this year. Judging is open to the public so long as you rate at least five games by November 15. I usually play enough to reach the minimum, even though sadly, I always declare that I’ll play more and fall far short. I’ve written once before about the entries I’ve played, back in 2014 when I first discovered the competition. I’m going to try that once again. This time, instead of trying to compile my thoughts all at once at the end, I’ll update this post as I go. Hopefully less likely to burn myself out, but a lot more messy, with less-than-fully-formed thoughts and surely plenty of typos. As usual, I’ll click the competition’s handy randomizer button to determine what games I’ll play. Wish me luck! A surrealist piece of work about feelings of depersonalization. Structured like a personality test this game seems to capture the disorder very well though I don’t have a lot of knowledge about the science of it. Seems like something I suffer from though, honestly. In the end, however, this game felt like someone had just discovered a cool bit of CSS/HTML coding and wanted to do something with it. It looped confusingly a lot. Bonus points for recommending a soundtrack to play along with it. IF games don’t do that enough. While this game isn’t all it seems to be and the rough edges you experience at first are purposeful, some actual rough edges start to show later on. I don’t know the developer’s history but it feels like they have some things to learn and this was them trying out some design ideas. The interface was disjointed and I wasn’t always sure where I supposed to be looking. I wish the game itself was full screen. Later in the game a fun mechanic is introduced though it felt very similar to the game Counterfeit Monkey where your objects and the world could be changed within a particular rule set. Those rules weren’t very clear and unfortunately I had to go to the hint system (thankfully there is one) to proceed. Some good seeds of an idea in there but needed to drop the facade faster. I hit the randomizer button on my lunch break today, praying that it would give me a shorter game to play. This game was listed as half an hour so it seemed my prayers had been answered. Also, I was delighted to discover a parser game where the previous two I had played were choice-based. Additionally, I was weirdly happy to see a sparse interface in this game; just a black background and simple white text. After the visual flash of the other games I was looking for something more simple. All this fit my mood perfectly but, unfortunately, the game didn’t hold up its end of the bargain. Poor communication from the game meant that I often struggled to figure out its available verbs. That, and the verb choices seemed to be arbitrary at times. “Go to” and “move to” often switched as the way to navigate the world, with one working but not the other– and then swapping. The developers made no effort to predict what the players might try to do and any irrelevant actions or actions not entered in an unreasonably-specific fashion were met with generic messaging (or no messaging at all). At some points I was to enter “wizard’s tower” as the noun and then at others only “tower” was accepted. The puzzle design was uninspired and at one moment I gave a derisive guffaw when prevented from retrieving a necessary item locked in place because… “magic”. Barreling ahead anyway, I soon came to a sudden and involuntary stop when I did something that killed my character with absolutely no indication that could happen. The game, an executable file, declared “game over” and shut itself down completely, closing the window. That’s ok, game. I was pretty much done with you anyway. What a delight that was! A well-written crime caper. I had to resort to the walkthrough a couple of times but it didn’t slow my enjoyment of the game. The game has a few “timed” events that only occur when you’ve either done something specific or have crossed through a room a certain number of times– a couple of those instances were the source of my struggles. A longer game but I’m glad I took the time to play. The competition’s leading contender from the (few) games I’ve played thus far. The blurb for this game gives an apology of sorts saying, “As a newbie, I am very excited to have created something and am thankful of this platform to share my work. Please leave your suggestions and other comments on what you would like to see improved/the same of in the next games in the series.” I was then reluctant to play it but in a way, I’m glad they made that declaration. I played the game with a softer eye and a lot more patience than I would have typically given it (see my lack of patience with Nightmare Adventure above). Here is someone new to IF development and they managed to successfully submit a game. That is itself an achievement. It is, however, indeed pretty rough. Typos, narrative inconsistencies (the character’s spouse is referred to as “Sarah” and “Dr. Sarah” so is her full name Dr. Sarah Sarah? ), and a general lack of polish are evident throughout the game. Line breaks–for the love of all that’s holy– add some line breaks. Plus, the developer declares that they’re working on more episodes but this game really should have gone a little further with its plot, as clunky as it was. Good effort, sub par product. If they were to join the competition again, I’d have to judge this level of work pretty harshly. Ok. I’m trying my best here. I’m trying to be patient and understanding with the breadth of entries in this competition. Did some jerk of a professor give their class an assignment of, “Submit an entry into the 2018 Interactive Fiction Competition”? Has the competition always had entries like these and I’ve be incredibly lucky and/or not gone deep enough into the entries to experience games like this? This game. This game was not good. It had all the elements of a Creative Writing 101 assignment turned in late. I can sum up this entry fairly quickly: there’s a misspelled word in the first paragraph. After my last experience I wasn’t feeling super positive about diving into another game in this competition. I started this game and tried to mentally reset so I’d give this entry a fair shot. It was ok! Not perfect but ok! Well, sort of. I’ll get to that. My main gripe was navigating around the game world. The conceit is that the character has been blinded and an nearly omni-present computer is helping to guide them around a sci-fi mining complex that has suffered some sort of catastrophe. There are a lot of rooms in a not-very-geometric map, so figuring out where I was at any given time was frustrating. In hindsight drawing a map would have been the way to go, but thankfully the walkthrough supplies maps and I just flipped between those and the game. Much better. The narrative is a little ham-fisted, especially at the beginning when the computer delivers much of the backstory, that while the player wouldn’t know it, the character certainly would. I found myself liking the simple puzzles, however, and was at least curious about where the story was going. Unfortunately I ran into a bug that wouldn’t let me progress and after checking the walkthrough, I’m fairly certain it’s a bug and not just me being dense. I shot an email to the developer just to check. *Edit: the developer wrote me back to say that it wasn’t necessarily a bug, just an awkwardly designed alternate path (that’s my interpretation of it). I didn’t really care enough to go back. Oh my, it’s been a while since I’ve played a competition entry. Already back on my path to not playing very many of these as I intended to, I see. Fall is always a busy season for me, plus I got distracted by a point and click graphical adventure called Hero-U, which is a post for another day. Murder at the Manor was simple but well-written. A fine read over coffee early on a Sunday morning. There were no real choices to be made here. The murder mystery story was fun though with fairly predictable characters. The only choice in this game came at the end when you had to declare the murderer, which in a way, was a surprise as I had already resigned myself to not having any say in the game until that point. I chose correctly and the story ended. I went back, however, to see if it even mattered who you chose, what with the story being so undemanding of your opinion. You actually can choose incorrectly, letting the murderer go and sullying your reputation as a detective. Alright then, I’m off to pour myself another cup of coffee and hopefully squeeze in another game before my family tires of sleeping in. Well, that was something different. I was quite turned off (pun intended) by this game’s too familiar approach, its aggressive double entendres, its misplaced anachronisms, and its fourth wall-breaking. But as I played I became weirdly intrigued by the sci-fi political world the game was building. The game was short so it didn’t get terribly deep into it all but I had more fun with it than I had realized at the time. Ah, man. The deadline for the competition is in a few days and I’ve not played nearly as many as I’d hoped. But, let’s be real, probably was always going to be this way. I’m going to try and squeeze in a few more before the end. Full disclosure: Jack Welch attends the local interactive fiction meetup I frequent and he’s a charming fellow. So, when I saw his game in the list I skipped the randomizer and played it instead. At first with En Garde I felt like I was missing some in-joke, that this game was a reference to something I wasn’t aware of, but as the game progressed I realized that it wasn’t quite as surreal as it seemed to be. The game starts off a bit confusingly, with its commands obscured and your character’s actions and dialogue intermingled. Later, however, you come to realize that’s all purposefully and cleverly done. Good job, Jack! It’s the final day of the competition! I’ve got a busy work day ahead but maybe I can get in a few more games before the deadline. The ‘ole randomizer led me to this game and… well, it was quite a while before I understood what was happening and even then, I can’t be entirely sure. This game is a browser-based Oregon Trail of sorts where you’re hauling and trading goods across Canada. It’s pretty janky with its buttons and interface popping in and out as you play. The economy of the game seems entirely arbitrary as the goods you buy and sell appear randomized. Plus you start out with an absurd amount of money making it confusing to gauge the value of your dollars. You do indeed explore the geography of Canada but each place you visit is only given one entry for a point of interest. It’s like the developer took each city’s top entry from their Wikipedia page. I kept waiting for the twist in this game, the typical interactive fiction “gotcha”. I kept wondering if suddenly the game would become deliberately surreal or slowly introduce new mechanics. I played about 20 minutes and as an avid geocacher, I was curious about the “The first bilingual geocaching tour in Atlantic Canada is located in Fredericton, New Brunswick.” entry in the “Tip and Tricks” section of the game’s manual. I made Fredericton my goal for whether I’d continue with this game. I arrived and got a sparse entry about that geocaching tour. The game continued as before, but I did not.